Cisco's WebEx is a hugely popular platform for scheduling meetings. You can conduct video and voice calls, screen sharing, and chat through the system. Meetings are usually created via a Web Portal were the user defines when the meeting starts, how long it goes for, and what services (e.g. screen sharing or just voice) their meeting will leverage. WebEx also provides a One-Click Client that offers standalone meeting scheduling and outlook integration so that users can avoid the Web Portal. The One-Click Client has the ability to save a user's password, so I decided to take a quick look at that functionality - in about an hour I was able to determine the storage, reverse the method it used to encrypt the password, and write a proof of concept tool to decrypt the local storage of the password. The aim of this blog post is to document that process and maybe encourage you to do some reversing! Usually the first step when evaluating client applications, is to get an understanding of what file system changes the application is performing (read/writes). This is especially true when you're looking for something thats being stored (in this case, the saved password) because stored info is usually written to a file, database, or within the Windows registry. Process Monitor is one of those core tools that everyone should have handy and is perfect for this use case. At this point in the process, we'll focus on One-Click's ptInst.exe executable. It's run during the initial install for One-Click and asks the user for username/password/server URL and if the application should save the password. 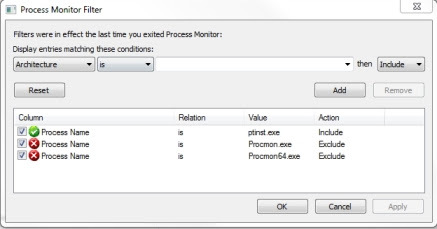 With ptInst.exe running, we can launch Process Monitor. Next up, provide the application a username, password and URL, and tell it to save the password. 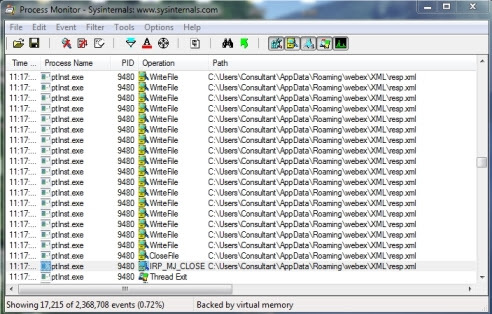 As soon as the login button is clicked, Process Monitor will show a ton of activity. The first thing that catches my eye is that there are a bunch of writes to the resp.xml XML file. It's common for applications to store configuration information in an XML file, so maybe we'll get lucky with this one. resp.xml does contain lots of data, but unfortunately there are 6 stars in place of the actual password (password length is greater than 6, fwiw). So back to Process Monitor. This is a pretty good indication that the password and password length are stored in the registry. To confirm, check the registry keys themselves. It turns out that the HKCU\Software\WebEx\ProdTools\Password key stores some hex value that isn't the cleartext password, and HKCU\Software\WebEx\ProdTools\PasswordLen contains the length of password. 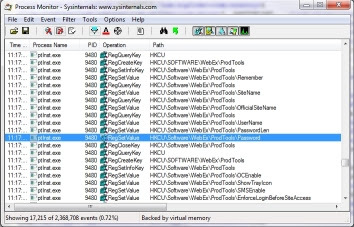 At this point, we need to determine what the value of HKCU\Software\WebEx\ProdTools\Password is. It's probably the password, but somehow obfuscated or encrypted and deciphering isn't obvious. 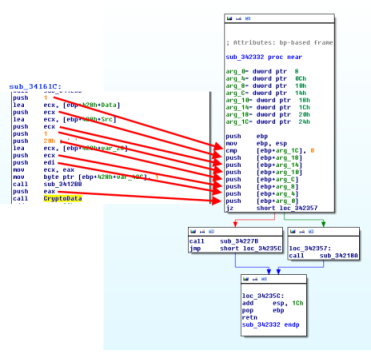 IDA Pro is another core tool. 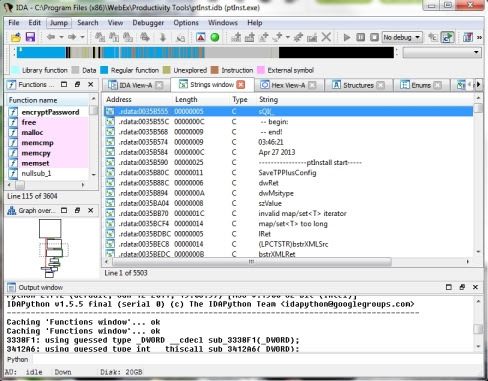 It's really the defacto tool for reverse engineering. Freeware and Evaluation versions are available and should be completely capable if you're following along (although I am using the paid version). If you search through the string list, you'll notice the registry key names aren't there. 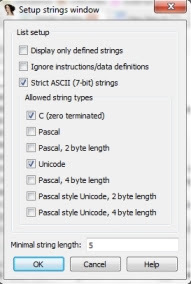 This is because by default, IDA will only show zero terminated ASCII C strings. We'll learn a little lower that our strings are passed to a Unicode Windows API function. Scrolling through the Strings Window a second time will reveal the unicode encoded key name we're looking for: "Password". Double clicking it will open IDA View-A and bring us to the data segment in the binary where the string is located. You'll notice that right above the unicode entry, at the same address, IDA automatically gave this location a variable name, "aPassword". 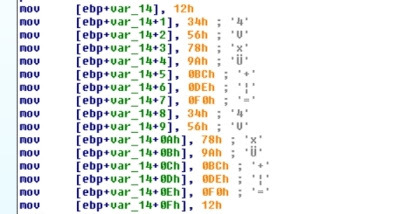 By selecting "aPassword" and pressing the "x" key, you'll see all of the cross references to that variable name - This is everywhere its used in the program. We just need to find where the registry key is either set or read and we'll likely see a call to some function nearby that decrypts it. The second reference, sub_34161C+1EB looks to be setting the value since a few instructions after the reference, a call to RegSetValueExW() is made. An observation to make is that the program is calling RegSetValueExW(). The "W" stands for "wide" which indicates the program is using the Unicode version of the RegSetValueEx() API function. This speaks to why we needed to configure our Strings Window to show Unicode strings. Had the function been RegSetValueExA(), we'd be using the ANSI version. If we look at the RegSetValueEx() MSDN Page we see that the fifth value passed to the function is a pointer to the data which is to be stored within the registry key. IDA helps us out a bit by showing the same data types for each of the values being pushed onto the stack as the MSDN entry. Looking at the fifth value pushed onto the stack (working backwards from the call to RegSetValueExW()), we see lpData, which is stored within the EAX register. It's value is loaded into that register by the prodceeding call, where we find its actually the value [ebp+428h+var_428]. 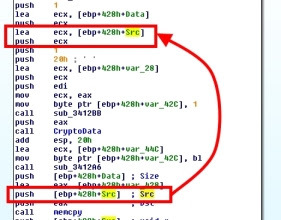 If we highlight that, then look at the previous references we'll discover that this value is always used above as the destination in an earlier call to memcpy(). So this means that it's likely the value being set for Password registry key is the result of the memcpy(). We'll need to realign our trace to follow the source variable of that memcpy() if we want to figure out how our saved password is stored. Looks like they all line up. Also make note of the cmp [ebp+arg_1c], 0. We can clearly see that the calling function sets that to 1, so we know that we'll be taking the negative branch on the jz below. And then there are calls to AES_set_encrypt_key() and AES_ofb128_encrypt().A quick search will reveal both of these functions are part of the OpenSSL libraries. What's even better is that someone else has already implemented these functions in an open project. For whatever reason the OpenSSL documentation doesn't have full coverage of both of these functions, so this project helps to reduce the effort in guessing what the higher level code looks like and ultimately what's needed to reimplement it. Which led me to believe the key was essentially the UserName value concantenated with the SiteName and repeated until it filled 32 characters (which accounts for the trailing "b"). As always, I contacted Cisco and let them know of my findings - and as always they were really responsive and welcoming. 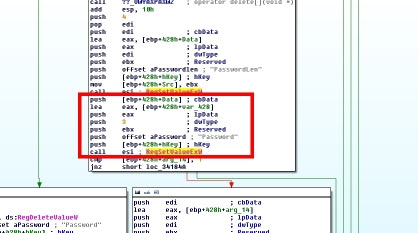 This issue is being tracked under Cisco PSIRT Case PSIRT-0219916903 and Bug ID CSCuh73132 if you want more info! I like how you got to the result without having to understand vast swathes of ASM. Nice and tidy! Hi there very nice article. As I am still learning, could you clarify how you get the "fully assembled" constanst and set the breakpoint to the function using WinDbg?